WW2 Weapons are a result of rapid technological innovation in response to the needs of the various combatants. Many different weapons systems we see today evolved from World War 2 warfare. Scroll down to see more articles about the history of WW2 weapons. Here you will find articles about the individual and collective WW2 weapons used by the Allied soldiers, whethe on foot or exiting landing ships, and German soldiers during the Battle of Normandy. Click on the articles listed below to learn more. This article is part of our larger D-Day resource meant to provide facts, information, and stories about the WW2 weapons, characters, tactics, and strategies of D-Day. Visit our more popular pages if you would like to learn more about one of the most important days in U.S. military history. This article focuses on WW2 vehicles used by Americans, the British, and Germans. The types of vehicles varied greatly on the theatre of war and particular battle conditions. To simplify this list, vehicles that appear at D-Day are given primary focus. The U.S. Army’s acronym for the amphibious truck (DUKW) was pronounced ‘‘Duck,’’ which was appropriate for a waterborne craft equally at home on land. The name was derived from the manufacturer’s designators D (model year 1942), U (amphibious), K (all-wheel drive), and W (dual rear axles). The Duck was based on a standard two-and-a-half-ton truck chassis with six wheels and could make five and a half knots in water but upward of 50 mph ashore. With all-wheel drive for its three axles it had excellent traction, making it a desirable cross-country vehicle. It could deliver between twenty-five and fifty troops or five thousand pounds of cargo. First employed in Operation Husky, the invasion of Sicily in July 1943, DUKWs were a mainstay of U.S. Army amphibious operations, including the invasion of Italy and Normandy. Some twenty-one thousand were manufactured throughout the war. Normally four bulldozers were allotted to each U.S. infantry division, but more were provided for Overlord. Even then, very few got ashore in time to help—just three of sixteen at Omaha Beach. The difficulty of unloading the heavy vehicles in deep water proved more of a problem than did enemy action. However, those that did survive unloading and German fire proved extremely useful. They removed obstacles and bladed clear paths for other vehicles across the dunes leading inland. After the beachhead was secure, bulldozers were constantly in use by engineers to improve roads and construct advanced airfields. General Eisenhower considered bulldozers so important that he listed them as one of the significant WW2 weapons of the European campaign. Bulldozer blades also were affixed to Sherman tanks. The halftrack was a hybrid, a lightly armored vehicle with front wheels and a tread in the rear. Its mobility and cross-country capability made it ideal for mechanized infantry, though halftracks also were adapted for light artillery and antiaircraft use. The U.S. Army mainly deployed the M2, M3, and M5 series of halftracks, built by Autocar, White, and Diamond T companies. Dimensions and performance were similar: about twenty feet long (including a tenthousandpound winch), a six-cylinder, 148 hp engine, and three thousand pounds empty weight. Halftracks could reach 45 mph and cruise 220 miles carrying ten to twelve men. Armament generally was a pedestal-mounted .30 or .50 caliber machine gun plus small arms. Mines and hand grenades also were included. The most impressive halftracks were M16 (White) and M17 (International) versions mounting quad-.50 mounts for antiaircraft defense. The most iconic of American WW2 vehicles. Officially the jeep was a quarter-ton truck, but its versatility exceeded that designation. Easily the most famous vehicle of World War II, the jeep derived its name from the acronym for GP (general purpose) vehicle. When the German army overran Western Europe in 1940, the importance of mechanized transport became apparent to the United States. Consequently, the U.S. Army issued a seemingly impossible request to 135 companies: produce a prototype quarter-ton light truck in forty-nine days. Only two firms responded—American Bantam and Willys-Overland. The Bantam prototype was rolled out on 21 September 1940, followed by Willys and a belated Ford entry. Willys’s exceptional engine produced 105 foot-pounds of torque compared to eighty-five for the Ford, while Bantam’s design was overweight. The army ordered 1,500 examples from Willys and Ford with deliveries commencing in the spring of 1941. As a consolation, Bantam was given the contract for building the trailer designed to be towed by jeeps. The jeep was ten feet, nine inches in length and had an eighty-inch wheel-base; its ground clearance was not quite nine inches. The heart of the rugged little vehicle was a four-cylinder, 55 hp engine that yielded a surprising twenty miles per gallon fully loaded. It became a four-wheeldrive, light truck capable of carrying five soldiers, eight hundred pounds of cargo, or towing a 37 mm antitank gun. Over the next four years an incredible 640,000 jeeps were built, 56 percent by Ford, which received a production license from Willys. Nearly onethird of all jeeps went to the British or Soviets, while typically 149 were issued to every U.S. Army infantry regiment. Jeeps were used in every theater of war for reconnaissance, casualty evacuation, resupply, and all manner of support roles. The four-wheel-drive feature combined with the engine’s torque enabled the jeep to traverse seemingly unpassable terrain, whether steep hills, rutted ravines, or muddy quagmires. Airborne units especially appreciated jeeps, as the quarter-ton trucks fit in gliders and provided both reconnaissance and much-needed transport behind enemy lines. In 1944 infantry glider regiments had twenty-four jeeps, and parachute regiments had seventeen. Armament usually consisted of a pedestal-mounted .30 or .50 caliber machine gun. Gen. Dwight Eisenhower considered the jeep one of the most significant WW2 weapons of World War II; Gen. George C. Marshall called it America’s greatest contribution to modern warfare. A half-ton, four-by-four vehicle made by Dodge, the command car carried a driver and four passengers. Empty weight was 4,600 pounds, but a thousand pounds of payload brought operating weight to 5,600. With a six-cylinder engine it was capable of 56 mph; nominal range was three hundred miles. A Dodge design from Chrysler Corporation, the half-ton WW2 weapons carrier was a versatile machine. With an empty weight of 4,200 pounds, it carried a half ton of equipment or personnel. Its four-wheel-drive capability enabled it to ford a stream nearly three feet deep, and the six-cylinder engine drove it at 55 mph. Though shorter than the half-ton carrier, the Dodge three-quarter-ton vehicle delivered 50 percent more WW2 weapons, troops, or equipment. Its performance was comparable, reaching 54 mph with a 240-mile range. Both types of carriers were often equipped with a powerful winch capable of towing a five-thousand-pound load. Several general-purpose trucks delivered troops, fuel, food, ammunition, and other supplies during the Normandy campaign. Smallest were the one-and-a-half-ton variety from Chevrolet, Dodge, and Ford, with a basic weight of 7,550 pounds and a three-thousand-pound capacity. They were two-axle vehicles with six-cylinder, 83 hp engines capable of 48 mph with a 270-mile cruising range. A three-axle Dodge was a useful six-by-six that could ford nearly three feet of water. Its empty weight of 6,900 pounds transported a ton and a half of cargo almost 250 miles, reaching top speeds of 54 mph. The in-line sixcylinder engine was rated at ninety-two horsepower. Perhaps the most famous category of military trucks was the ‘‘deuce and a half,’’ built in at least three basic models, with a five-thousand-pound capacity. There were two- and three-axle chassis with a basic weight of 7,300 pounds and ten thousand pounds, respectively. The latter were six-by-four and six-by-six models with good cross-country capability and road speeds of 45 mph. Range varied between 230 and three hundred miles. Manufacturers included General Motors, Studebaker, International Harvester, and Mack. Some four hundred thousand such vehicles were shipped to Russia, helping make the Red Army more mobile than the Wehrmacht. Four-ton trucks were two-axle models from Four-Wheel Drive Company and three-axle from Diamond T. The four-by-four version weighed 11,400 pounds empty, the six-by-six 18,400. They transported eight thousand pounds at 35 to 40 mph on roads, though the smaller vehicle possessed greater range—220 miles compared to 180. About one-quarter of the Diamond T versions were built with M36 ‘‘sky mounts’’ for .50 caliber machine guns as antiaircraft defense. Large, three-axle trucks needed to tow heavy artillery and similar objects were called ‘‘prime movers.’’ The U.S. Army had two basic models: a six-ton vehicle from Brockway, Corbitt, Mack, and White; and a seven-and-one-half ton truck from Mack. Both were six-by-sixes; the former a general-purpose vehicle weighing twenty-two thousand pounds, while the latter was 29,600 pounds empty, used for towing 155 mm and 240 mm artillery pieces. Both were capable of 30 to 35 mph without a load. The Bren Gun Carrier is perhaps most iconic of British WW2 vehicles. Despite the name, the Bren gun carrier was not specifically designed to carry a Bren gun and crew. Designated the British Universal Carrier (BUC), it was a tracked general-purpose vehicle capable of 35 mph on open ground. The BUC normally had a two-man crew—commander and driver—but the V-8 engine was so loud that communication was nearly impossible. Its lightly armored, open body design permitted easy access and could accept a variety of loads, including a two-inch mortar or light antitank WW2 weapons. It also served as a troop transport and command vehicle with three passengers besides the crew. The carrier could tow a 37 mm antitank gun or a trailer. Production was expanded to Canada, Australia, and the United States. A Bren gun carrier appears in The Longest Day—the beachmaster (Kenneth More) pounds the vehicle into life with his shillelagh. Roughly equivalent to the U.S. Jeep among German variants of WW2 vehicles but not as versatile, the Kurbelwagen was developed from the Volkswagen ‘‘people’s car’’ with a four-seat capacity and convertible top. The rear-mounted, air-cooled engine produced 24.5 hp, which yielded about 50 mph on level ground. Its two-wheel drive pre- vented any similarity in cross-country performance with the Jeep, though a Schwimmwagen amphibious version was produced. Maj. Werner Pluskat (Hans-Christian Blech) of the 352d Division is strafed in a Kurbelwagen in The Longest Day. The Germans pioneered the class of military vehicles known as ‘‘armored personnel carriers.’’ Beginning in 1939, the one-ton Sd. Kfz. 250 was followed by the three-ton Sd. Kfz. 251, which also accepted a 37 mm antitank or 20 mm antiaircraft gun. Built with light protection (usually six to fifteen millimeters), they possessed unusually good defensive qualities, owing to the sloped armor. Probably the most common version in Normandy was the 251D, produced from 1943 onward. It was capable of some 30 mph on roads with 180-mile range. Apart from carrying panzer grenadiers into action, halftracks were enormously versatile. Among other missions, they functioned as command vehicles, communication platforms, ammunition carriers, and battlefield ambulances. 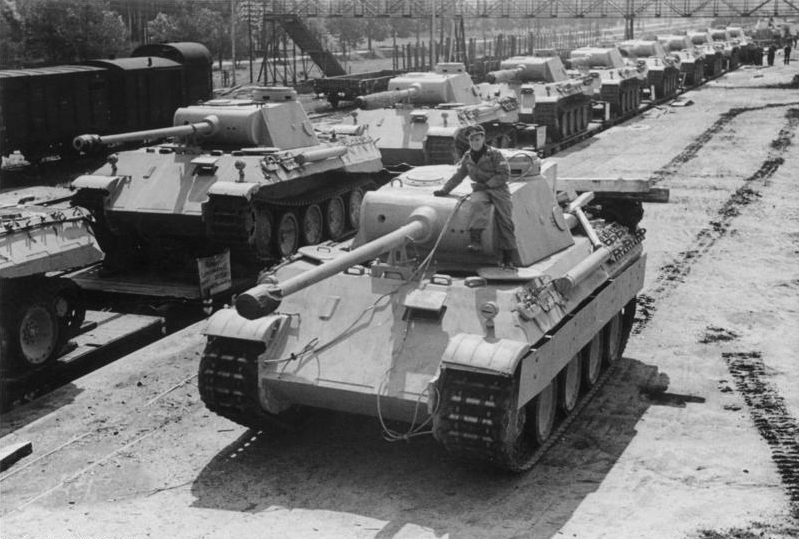 According to various sources, from fifteen to sixteen thousand or more German halftracks were built during the war. At least five manufacturers were involved, including Auto Union, Maybach, and Norddeutsche. Like the Allies, the Germans produced a variety of military trucks including, ironically, American designs. The Opel Blitz was a three-ton general-purpose vehicle with several specialized bodies. The 3.6 series chassis was basically a Chevrolet commercial type with a 3.6-liter water-cooled six-cylinder engine of about sixty-eight horsepower. A four-wheel-drive version was designated Type 6700. Ford designs were the basis of the three-ton capacity G917 and G997 models, with 78 hp V-8 water-cooled engines. The latter, with a larger bore, had a 3.9-liter engine. Both were two-wheel drive. Another three-ton model was the Mercedes Benz LCF 3000, with a fiveliter, four-cylinder diesel. The transmission afforded four forward speeds and one reverse; an auxiliary gearbox permitted road or cross-country gear ratios. However, the two-wheel-drive design limited off-road use. Perhaps the most useful German truck was the Bussing-NAG diesel, rated at four and one-half tons capacity. American tests of captured examples demonstrated an average road speed of 21 mph in traffic, with fuel mileage of better than eight miles per gallon. Most notably, the Bussing accepted loads of six and three-quarter tons without difficulty. The German army designated its heaviest vehicles as prime movers, generally for towing the largest mobile artillery pieces. Probably the most common were eight-ton medium halftracks from Hansa-Lloyd and KM, appearing in 1935 and 1939. Three, five, and twelve-ton models also were produced. Armored warfare was a salient feature of the Second World War; among WW2 tanks the Allied and German armies all employed tanks and other armored vehicles. Apart from battle tanks (which the British called ‘‘cruisers’’) there were infantry support tanks, reconnaissance vehicles and armored cars, personnel carriers, and tank destroyers, which often were based on tank chassis. There were even plans to put tanks on landing craft. At the start of the Normandy campaign the Allies possessed about 5,300 tanks compared to Germany’s 1,500. To focus on a particular instance in which WW2 tanks came into direct conflict, this article will focus on the Invasion of Normandy. Though America produced enormous numbers of armored vehicles (forty-seven thousand tanks alone in 1943–44), only two main types were used by the U.S. Army. When the M3, an evolutionary design based on the M2A4, was introduced in March 1941 it was in no way competitive as a battle tank. Certainly it could not compare to the German Mark IV or the British Crusader, let alone the Soviet T-34. However, the M3 was available in numbers sufficient for export and used by the British, who dubbed it the ‘‘Stuart’’ after the Confederate cavalry hero of the American Civil War. Armed with only a 37 mm gun and protected by no more than two inches of armor, it was nevertheless fast and agile with a four-man crew. Powered by either gas or diesel engines, Stuarts could reach thirty-seven miles per hour on roads. In Normandy, the M3 had no chance against German armor but was useful as an infantry support and reconnaissance vehicle. From 1941 to 1943 Stuarts were built in three main variants and several lesser models. Total M3 production was some 13,600 tanks, of which 5,400 were provided to Britain and 1,600 to Russia. British tankers were so fond of the type that they nicknamed it ‘‘Honey,’’ and not without reason—it was fast, reliable, seldom threw treads, and proved reasonably easy to maintain. The M5 was an upgraded version of the M3, weighing 16.5 tons. Owing to a need for more tanks of already existing models, the first of some 6,800 M5s were not delivered until November 1942. The M5 was primarily distinguished from the M3 by sloping glacis armor and a larger engine compartment to accommodate two Cadillac V-8s. The Sherman had many failings as a battle tank. Its gasoline engine (variously 425 to 500 horsepower) was prone to ‘‘brewing up’’ and burning its five-man crew to death. Consequently, diesels were used in M4A2s and A6s. It was tall and top-heavy, making it a better target than the panzers or T-34, and it was outgunned by enemy tanks. However, it also had significant advantages, not least of which was availability. More than forty thousand Shermans were built from 1941 to 1946, meeting the needs of not only the U.S. Army but partly those of the British and Soviets as well. The Sherman, weighing between thirty-three and thirty-five tons, had armor 1.5 to 2.5 inches thick, easily defeated by many German weapons. In fact, Wehrmacht gunners described Shermans as ‘‘Ronsons’’ for the ease with which they could be made to burn. Though the M4’s 75 mm gun was adequate for originally envisioned purposes, the requirement set for a ten-thousand-round tube life dictated a low muzzle velocity, leading to poor penetration, and it is doubtful that many Shermans fired much over five hundred rounds. With greater experience, the British recognized the armament problem and upgraded to a seventeen-pounder (76 mm) in the Firefly version. Shermans lent themselves to other uses as well, including the chassis and hull for the M10 tank destroyer and a variety of engineering vehicles. Conventional Shermans were fitted with the duplex drive kit and inflatable ‘‘skirts’’ for amphibious operations but proved largely unworkable on 6 June. “Funny” devices were added for the D-Day campaign, especially bulldozer blades and field-designed plows capable of penetrating the exceptionally thick foliage of Normandy’s bocage. The latter were developed by Sgt. Curtis Culin of the Second Armored Division, using scrap steel from destroyed German obstacles. The M18 tank destroyer sustained a three-year development period, beginning with the dead-end T49 gun motor carriage (or GMC) with, progressively, 37, 57, and 75 mm WW2 weapons. The constant was a Continental R975 400 hp radial engine retained in the T67 vehicle, approved by the army in 1943. At that time the Tank Destroyer Command decided on a highvelocity 76 mm gun. Six prototypes were built as the T70 GMC, which was modified with a new hull face and an open, full-traversing turret. Designated M18, the new tank destroyer was fairly light at twenty tons, clocking 45 mph on the road and twenty cross-country. Buick began production in February 1944, delivering 2,500 through October of that year. A five-man crew was protected by half-inch hull armor and one inch in the turret, which proved insufficient once the Germans learned the vehicle’s shortcomings. However, the Hellcat’s speed and agility enabled it to ‘‘get out of trouble faster than it got in.’’ During July 1944 the 630th Tank Destroyer Battalion claimed fifty-three German tanks and fifteen self-propelled guns destroyed in exchange for seventeen Hellcats. The British army lost most of its tanks at Dunkirk in 1940 and had to rebuild its armored force. Throughout the war Britain produced some twenty-four thousand armored vehicles of its own but received 3,600 built in Canada and 25,600 from America. If anything, Britain obtained too many different models of tanks and armored vehicles, where it might have concentrated on a few proven designs. Developed from the Cromwell, the Centaur was distinct in having a Liberty engine, but most were subsequently converted to Cromwells by reequipping with Meteor engines. Because Centaurs were built with sixpounder guns they were considered unsuitable for combat and were primarily used as training vehicles. Some were put to other uses, such as antiaircraft platforms with twin 20 mm cannon or armored reconnaissance vehicles. However, eighty were upgraded with 95 mm howitzers for the Royal Marine Armoured Support Group (See British Royal Marines) on D-Day. The forty-ton Churchill was among the heaviest Allied tanks of World War II. Like most British tanks it had a five-man crew. Its 350-horsepower engine, a Bedford twin six, drove it at barely twelve miles per hour, owing to its unusually heavy protection of six-inch frontal armor. Armed with a 75 mm main gun, the Churchill was better able to engage German armor than any other British tank. The Crocodile variant of the Churchill was a flamethrower tank, towing a trailer with four hundred gallons (1,810 liters) of fuel, enough for eighty seconds’ duration. The flame jet could be streamed 120 yards, though seventy-five yards was considered the maximum effective distance. The Cromwell replaced the ineffective Crusader and was deployed in early 1943. Powered by a six-hundred-horsepower Rolls-Royce Meteor engine, the twenty-seven-ton Cromwell was variously reported as having top speeds on flat terrain of thirty-eight to fifty miles per hour. It mounted a 75 mm cannon and was protected by armor between a third of an inch and three inches thick. The need for armored support of airborne troops led to the Tetrarch, which became the basis around which the large Hamilcar glider was designed. Weighing barely eight tons, the Tetrarch had a 165-horsepower engine that drove it upward of forty miles per hour on flat terrain. The three-man crew fired a 76 mm close-support howitzer, being protected by armor of half-inch maximum thickness. Germany and the Soviet Union built the best tanks of World War II. Among WW2 tanks, the series of Panzerkampfwagen (armored fighting vehicles) that spearheaded Hitler’s blitzkriegs in Europe and Russia caught the world’s attention and convinced other Western nations of the need to match the German standard. Unlike Britain, which produced a variety of mediocre designs, the German panzer force relied essentially on three types, each excellent for its purpose. Many German tanks used diesel fuel, which gave their crews an excellent chance of surviving battle damage, in contrast to the American Sherman, with its gasoline-powered engine. The Mark IV was the most common German WW2 tank, and therefore in Normandy. More than eight thousand were built. Designed in 1937, the early models were armed with short-barreled 75 mm guns best suited for infantry support. However, combat experience—especially in Russia— demonstrated the need for more velocity and attendant greater penetration of enemy armor. Therefore, a long-barreled gun was added; the resulting Mark IVG became the third main variant, appearing in 1943. It weighed 25.5 tons and was powered by a Maybach three-hundred-horsepower engine delivering a top speed of twenty-five miles per hour. The five-man crew was protected by thirty to eighty millimeters (1.2 to 3.2 inches) of armor and had a standard load of eighty-seven main-gun rounds. One of the most attractive tanks of all time, the Panther incorporated wartime experience in its design. Its sloping armor (up to fifty-five degrees) was calculated to deflect enemy rounds striking at any angle other than nearly ninety degrees. With forty to eighty millimeters (1.6 to 3.2 inches) of armor and a high-velocity Kw.K.42 75 mm gun, the Panther was a formidable opponent on any front. Though unusually heavy for its day, at some fifty tons (about twice the Mark IV), the Mark V was reasonably fast—its gasoline Maybach 690-horsepower engine drove it at twenty-five miles per hour—but it could cruise 125 miles on roads. Panthers were deployed in time for the battle of Kursk in Russia during the summer of 1943 but experienced mechanical problems there. Subsequent improvements were made to the suspension and transmission, and some five thousand Panthers were ultimately produced. The definitive German tank, the Tiger appeared in 1942. It was a sixtytwo-ton land cruiser with the awesome 88 mm Kw.K.36 L/56 (i.e., barrel length equal to fifty-six bore diameters) cannon that was already feared and respected by the Allies. The gun was extremely accurate; reportedly, it could place five rounds within eighteen inches of each other at 1,200 yards. The Tiger was protected by sixty-two to 102 millimeters (2.4 to 4 inches) of armor, rendering it almost impervious to conventional antitank WW2 weapons. It had the same basic engine as the Panther—a twelve-cylinder, 690 hp Maybach, which produced a respectable road speed of twenty-four miles per hour, about half as fast cross country. Despite their strengths, Tigers were so expensive to produce—just 1,340 were made—that they were issued to only company and occasionally battalion-sized units. The seventy-ton King Tiger was not considered as successful as the original model, being better suited to defense than offense. In fact, some bridges could not support the ‘‘Royal’’ Mark VI. In 1942 the Marder (named for the marten, a tree-climbing weasel) was a ‘‘quick fix’’ for German armored units suddenly confronted with superior Soviet tanks like the T-34. The German PaK.40 75 mm gun was mated to the Czech 38(t) chassis with a Praga six-cylinder gasoline engine of 150 hp. The open-top, twelve-ton vehicle took a four-man crew. Nearly 1,000 Sd. Kfz. 138s were procured, as were 344 Sd. Kfz. 139s with the Soviet 76 mm gun chambered for German ammunition. Most of the latter were sent to the Eastern Front, though about sixty-five were shipped to North Africa. As a production expedient this self-propelled assault gun was based on the Panzer Mark III chassis with 20-to-81-millimeter (0.8-to-3.25-inch) armor. Overall length (including gun) was twenty-two feet, six inches; height seven feet. It was produced in two main versions—the 142/1 with a 75 mm gun and the 142/2 with a 110 mm howitzer. Both were intended as infantry support vehicles, but the first version also proved effective in the antitank role. However, the 142/2 was among the most numerous German armored vehicles, with some 7,700 produced. The Stu.G. IIIs weighed about twenty-six tons, with the same Maybach V-12 gas engine of 300 hp. Built on a Panther chassis, the ‘‘Hunting Panther’’ lacked the Panzer Mark V turret but mounted the long-barreled 88 mm PaK.43 L/71 (length equaled seventy-one diameters), which was capable of destroying any Allied tank in France. Weighing fifty-one tons with a five-man crew, the Jagdpanzer was powered by a Maybach V-12 gas engine of 700 hp, which drove it at 28 mph on roads. Like the Marder, the Hetzer (Baiter) was built on the four-man Czech 38(t) chassis with the Praga 150 hp engine. However, it was a fully enclosed vehicle of 17.6 tons, measuring sixteen feet long and seven feet high. It mounted a 75 mm PaK.39 L/48 gun that could penetrate most armor at typical engagement distances. With its seven-foot silhouette and twenty to sixty millimeters (0.8 to 2.4 inches) of sloping armor, the eighteen-ton Hetzer was an effective tank killer, though its limited traverse was a drawback. It could make 24 mph on roads and 10 mph cross country. More than 2,500 were produced. Naval artillery has been a primary feature of naval power since cannons were mounted to war vessels. But they were a critical component of Allied victory in World War Two, particularly at D-Day. This article will describe the naval artillery available to America on June 6, 1944. Lacking sufficient land-based artillery in the assault divisions on D-Day, the Allies brought powerful naval artillery to Normandy. It was provided by seven battleships, twenty-three cruisers, ninety-three destroyers, two monitors, and two gunboats. Supporting vessels included 142 escorts or corvettes and fifteen sloops. The Germans kept their reserves well inland, away from the landing beaches and landing ships, having experienced Allied NGF in Sicily and Italy. Because most gunfire support ships could not see their targets, indirect fire was required. Aerial observation was an important aspect of effective NGF, though weather conditions on 6 June tended to obscure targets. Both infantry and airborne forces had gunfire spotters down to the battalion level, and some naval officers jumped with the paratroopers to provide an organic spotter capability. Some destroyers slid within a few hundred yards of their assigned beaches to support the army, and though communication problems frequently arose, the overall effect was largely beneficial. The chief of staff of the First Infantry Division later stated that the ‘‘Big Red One’’ would not have been able to move off Omaha Beach without effective naval gunfire. USS Arkansas (BB 33). Wyoming class, commissioned 1912. USS Texas (BB 35). New York class, commissioned 1914. HMS Bellona. Bellona-class light cruiser, commissioned 1943. HMS Glasgow. Southampton class, commissioned 1937. FFL Georges Leygues (French). La Glossonairre–class light cruiser, commissioned 1937. FFL Montcalm (French). La Glossonaire–class light cruiser, commissioned 1937. USS Baldwin (DD 624). Livermore class, commissioned 1943. • USS Carmick (DD 493). Livermore class, commissioned 1942. USS Doyle (DD 494). Livermore class, commissioned 1942. USS Emmons (DD 457/DMS 22). Ellyson class, commissioned 1941/44, sunk off Okinawa 1945. USS Frankford (DD 497). Livermore class, commissioned 1943. USS Harding (DD 625/DMS 28). Ellyson class, commissioned 1943/44. USS McCook (DD 496). Livermore class, commissioned 1943. USS Satterlee (DD 626). Livermore class, commissioned 1943. USS Thompson (DD 627). Livermore class, commissioned 1943. HMS Melbreak. Hunt class, commissioned 1942. HMS Talybont. Hunt class, commissioned 1943. HMS Tanatside. Hunt class, commissioned 1942. USS Nevada (BB 36). Nevada class, commissioned 1916. HMS Black Prince. Bellona-class light cruiser, commissioned 1943. HMS Enterprise. E-class light cruiser, commissioned 1926. HMS Hawkins. Hawkins class, commissioned 1919. USS Quincy (CA 71). Baltimore class, commissioned 1943. USS Tuscaloosa (CA 37). Astoria class, commissioned 1934. HMS Erebus. Erebus class, commissioned 1916. 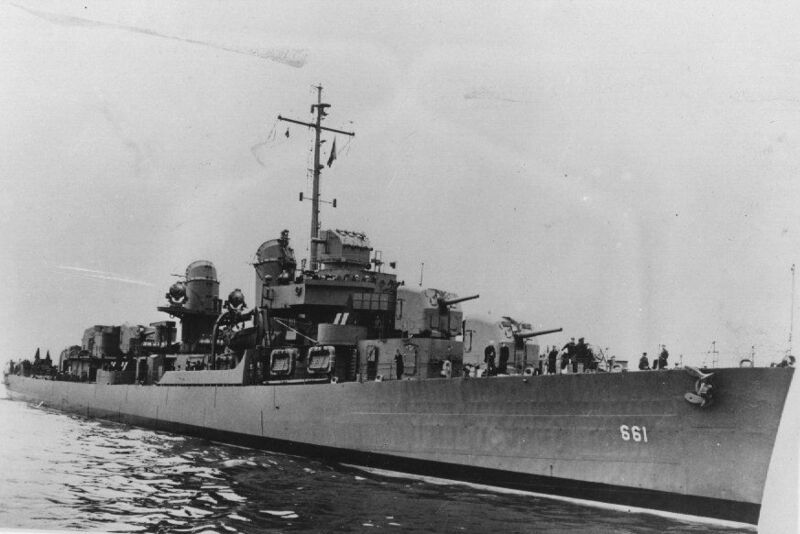 USS Butler (DD 636/DMS 29). Ellyson class, commissioned 1942. USS Corry (DD 463). Gleaves class, commissioned 1942, sunk 6 June. USS Fitch (DD 462/DMS 25). Ellyson class, commissioned 1942/44. USS Forrest (DD 461/DMS 24). Ellyson class, commissioned 1942/44. USS Gerhardi (DD 637/DMS 30). Ellyson class, commissioned 1942/44. USS Herndon (DD 638). Livermore class, commissioned 1943. USS Hobson (DD 464/DMS 26). Ellyson class, commissioned 1942/44. USS Shubrick (DD 639). Livermore class, commissioned 1943. USS Bates (DE 68/APD 47). Buckley class, commissioned 1943. USS Rich (DE 695). Buckley class, commissioned 1943, sunk 8 June. HNMS Soemba (Dutch). Flores class, commissioned 1926. HMS Argonaut. Dido class, commissioned 1942. HMS Ajax. Leander class, commissioned 1935. HMS Emerald. Emerald class, commissioned 1926. HMS Orion. Leander class, commissioned 1934. HMS Cattistock. Hunt class, commissioned 1940. HMS Cottesmore. Hunt class, commissioned 1940. HMS Grenville. G class, commissioned 1943. HMS Jervis. J class, commissioned 1939. ORP Krakowiak (Polish). Hunt class, commissioned 1941. HMS Pytchley. Hunt class, commissioned 1940. HMS Ulster. U class, commissioned 1943. HMS Ulysses. U class, commissioned 1943. HMS Undaunted. U class, commissioned 1944. HMS Undine. U class, commissioned 1943. HMS Urania. U class, commissioned 1944. HMS Urchin. U class, commissioned 1943. HMS Ursa. U class, commissioned 1944. HNMS Flores (Dutch). Flores class, commissioned 1926. HMS Belfast. Edinburgh class, commissioned 1938. HMS Diadem. Bellona class light cruiser, commissioned 1944. HMCS Algonquin. V class, commissioned 1943. HMS Bleasdale. Hunt class, commissioned 1942. FFL La Combattante (French). Hunt class, commissioned 1942, lost in 1945. HMS Faulknor. F class, commissioned 1935. HMS Fury. F class, commissioned 1934. Sunk 21 June 1944. HNoMS Glaisdale (Norwegian). Hunt class, commissioned 1942. HMS Kempenfelt. W class, commissioned 1943. HMCS Sioux. V class, commissioned 1944. HMS Stevenstone. Hunt class, commissioned 1943. HMS Ramilles. Royal Sovereign class, commissioned 1917. HMS Warspite. Queen Elizabeth class, commissioned 1916. U.S. Navy battleship Nevada bombarding the invasion beaches: Martin K.A. Morgan. HMS Arethusa. Arethusa class light cruiser, commissioned 1935. HMS Danae. D-class light cruiser, commissioned 1918. OPD Dragon (Polish). Dragon-class light cruiser, commissioned 1917, torpedoed 8 June. HMS Frobisher. Hawkins class, commissioned 1924. HMS Mauritius. Fiji-class light cruiser, commissioned 1941. HMS Eglington. Hunt class, commissioned 1940. HMS Kelvin. K class, commissioned 1939. HMS Middleton. Hunt class, commissioned 1942. HMS Saumarez. S class, commissioned 1943. HMS Scorpion. S class, commissioned 1943. HMS Scourge. S class, commissioned 1943. HMS Serapis. S class, commissioned 1943. ORP Slazak (Polish). Hunt class, commissioned 1942. HNoMS Stord (Norwegian). S class, commissioned 1943. HNoMS Svenner (Norwegian). S class, commissioned 1944, lost 6 June. HMS Swift. S class, commissioned 1943. HMS Verulam. V class, commissioned 1943. HMS Virago. V class, commissioned 1943. HMS Roberts. Roberts class, commissioned 1941. Most of the U.S. Navy destroyers off Normandy were Livermore (DD 429) class ships. Sixty-four were commissioned from 1940 to 1943; the nameship remembered a Connecticut captain of the Continental Navy. Originally mounting five five-inch .38 caliber guns and ten torpedo tubes, they were reduced to a more manageable four turrets and five tubes. They were rated at 1,630 tons standard displacement, 348 feet length, and thirty-six-foot beam. Their fifty-thousand-shaft horsepower delivered thirty-seven knots. Twelve destroyers were converted to destroyer (i.e., high-speed) minesweepers (DMS) in early 1944 with all tubes and one five-inch turret removed, yielding the new Ellyson class. For Operation Overlord, 514 tanks were modified with duplex drive kits intended to give the armored vehicles an amphibious capability. This transformed them into the “DD Tank” — the duplex drive tank. The modifications—a British concept—mainly comprised a twin-screw propulsion system at the rear of the vehicle for water navigation and inflatable skirts, or ‘‘bloomers,’’ to aid buoyancy. Though the arrangement worked well for shallow water, such as rivers, it proved disastrous in ocean swells. The skirts afforded only a low freeboard, which left the hulls susceptible to being swamped. Gen. Bernard Montgomery’s Twenty-first Army Group staff decided to send the DDTanks ashore in the first wave, supported by naval gunfire. It was felt that the early presence of the DDTank on the beaches would demoralize Germans and provide rallying points for the assault troops, plus badly needed firepower against enemy strongpoints. The DD tank was expected to churn their way through rough seas and headwinds from as much as three nautical miles offshore, but very few survived the trip. Of one group of twenty-nine DD Shermans launched five thousand yards out, only two reached shore. Many crews drowned with their tanks, while others were forced to ‘‘abandon ship’’ when the ungainly vehicles sank or capsized. However, others were more fortunate, including one in an LCM with a bow that refused to lower, requiring the craft to beach itself for unloading. Some commanders had realized that the concept was totally unsuited to conditions off Normandy that day and ignored the order to launch the DD tanks. The 743d Tank Battalion delivered all of its Shermans directly to the beach. Arising from the Casablanca Conference of January 1943, the Combined Bomber Offensive (CBO) was a joint Anglo-American plan to destroy or cripple German transport and industry by day and night bombing. Among its chief architects was Maj. Gen. Ira C. Eaker, who would lead the U.S. Eighth Air Force until January 1944. The Combined Bomber Offensive was more a policy than a plan, as it contained few specifics beyond the provision for the Royal Air Force to continue night operations while the Americans flew by day. A target list was drafted, with priorities that would change throughout the war. However, as a rule, the CBO was to attack German submarine yards and bases, the fighter aircraft industry, transportation systems, and ball bearing and petroleum production. Unaccountably, Germany’s electrical grid was almost wholly overlooked; it was especially vulnerable, because it was not readily dispersed or moved underground. At the heart of the offensive was the American belief in precision daylight bombing conducted by unescorted aircraft such as the Boeing B-17 and Consolidated B-24. Eaker envisioned a fleet of a few hundred bombers as sufficient to accomplish the goal while keeping losses within the allowable 4 percent. British air leaders such as Sir Charles Portal and Bomber Command’s Sir Arthur Harris doubted that operations would confirm American optimism about daylight bombardment and preferred that Eaker’s force join the RAF night campaign. Nevertheless, in the interest of Allied unity they posed no serious objections and awaited events. As the RAF expected, the hard reality of the Luftwaffe fighter arm forced a reassessment later that year, and the Combined Bomber Offensive was saved only by timely arrival of long-range American fighters in late 1943. In early 1944 the Eighth Air Force was frequently targeted against enemy transport in France and Germany, seeking to impede the inevitable German response to D-Day. Strategic planners sometimes voiced objections, insisting that the heavy bombers should continue attacking German industry while the tactical air forces supported Overlord. In the end, the weight of Allied airpower ensured that both objectives were met, though probably not as efficiently as possible. The 7.5 cm Feld Kanone 38 was a three-inch fieldpiece weighing 3,136 pounds capable of firing twelve- to thirteen-pound high-explosive shells at nearly 2,000 fps. Maximum elevation was forty-five degrees, permitting a range of 12,500 yards. The piece was tractor towed. The most famous artillery gun of World War II was the Flak 88 cannon, an 8.8 cm high-velocity WW2 weapons equally applicable for antiaircraft and antitank use. The design, adapted in 1938, weighed about 9,600 pounds and was towed by a prime mover. It was served by an eleven-man crew, which occasionally could sustain twenty rounds per minute. With a muzzle velocity of 3,700 feet per second the projectile could defeat 130 mm (5.07 inches) of armor at 1,500 yards. Germany’s standard field artillery WW2 weapons were the 10.5-cm LFH.18/40, a World War I design upgraded with a muzzle brake that improved range to 13,400 yards. The four-inch howitzers were typically deployed in the three battalions (three batteries each) of an infantry division’s artillery regiment. Another 105 mm piece was the K.18 medium gun, with a range of more than twenty thousand yards. The 15 cm FH.18 was Germany’s division-level medium howitzer. With an all-up weight of six tons it fired high-explosive, armor-piercing, and smoke rounds weighing about ninety-five pounds to a distance of 14,600 yards. In a ‘‘Type 1944’’ infantry division, the six-inch WW2 weapons were deployed in one of the four artillery battalions. Other 150 mm WW2 weapons were the 15-cm K.18 and K.39 guns with ranges up to twenty-seven thousand yards. Easily among the most formidable of Germany’s mobile artillery was the 17 cm Kanone 18 cannon in a howitzer carriage. Extremely well designed, it was quick into action and permitted one soldier to traverse the nineteen-ton gun 360 degrees using the trail spike. At fifty degrees elevation, it fired a 6.7-inch, 140-pound shell at 3,000 fps to a range of thirty-two thousand yards, or eighteen miles. The German army’s heavy fieldpiece was the 21 cm Morser 18 howitzer. Its 250-pound projectiles were 8.27 inches in diameter—the size of a heavy cruiser’s main battery—with a maximum range of 18,300 yards. The gun and carriage were so large that in transit the twenty-one-foot barrel was supported by a traveling carriage, while the trail rested on a two-wheeled trailer. The howitzer’s weight in action was nearly thirty-seven thousand pounds. The heavier K.39/40 coastal version was even longer ranged. Coastal artillery used many of the same WW2 weapons mounted in casemates, usually manned by army units under navy control. In the Utah Beach sector, for instance, 110 guns from 75 to 210 mm were arrayed, capable of destroying landing craft or armored vehicles. In thirty sites along the Normandy beaches, coastal defense batteries in concrete bunkers totaled 128 ‘‘tubes’’ of from 100 to 210 mm, the most common being 105 and 155. Others were 122, 150, and 170 mm. Germany began developing tactical rocket projectors (generically called Nebelwerfers, or smoke projectors) in the early 1930s and eventually produced them in sizes from 100 to 300 mm. The most common were the Nebelwerfer 41, a 150 mm WW2 weapons with six tubes mounted on a 37 mm antitank gun carriage, and the 42, with five 210 mm barrels. Later in the war, Nebelwerfers were mounted on vehicles—mostly halftracks. The WW2 weapons was fired electronically, discharging its rockets in a ten-second volley to avoid excessive recoil. The spin-stabilized projectiles were tipped with explosives, gas, or smoke, with a typical range of some seven thousand meters. Nebelwerfers were first deployed to combat in Russia in 1941 but were widely deployed in France by D-Day. Both Heer (army) and Waffen SS batteries or regiments were encountered—thirty-five sites in the frontage of the 352d Infantry Division alone. The quick-firing (QF) seventeen-pounder was a three-inch (76 mm) howitzer introduced in 1942. It was primarily intended as an antitank gun, but no suitable carriage was available in production quantity until 1943, when the WW2 weapons entered combat in Italy. With a variety of ammunition it could defeat 130 mm of armor at a thousand yards. Its capability against Tigers was enhanced with discarding-sabot projectiles issued in 1944. Typically the 2.9-ton WW2 weapons was towed by a Morris Commercial C8/AT, served by a seven-man crew. The six-pounder (57 mm) gun Mark 2 replaced the prewar two-pounder antitank gun in 1941–42. Served by five men, it fired 6.38-pound round out to five thousand yards. However, its utility was limited in that no high-explosive ammunition was available until 1944. By then its antitank capability was demonstrably lacking against Panthers and Tigers, but a discarding-sabot round developed by 1944 prolonged the WW2 weapons’ use. At 1.1 tons it was light enough to be towed by a jeep. The standard British army artillery piece was the twenty-five-pounder (weight of the projectile), with a specified range of 13,400 yards. Longer ranged than its American counterparts, the 3.45-inch WW2 weapons were generally regarded as the Allies’ most effective antitank gun. With the discardingsabot round just coming into service in mid-1944, the twenty-five-pounder was rated to penetrate 130 mm (5.2 inches) of armor at a thousand yards. Nominally a 1944 British infantry division had seventy-two twenty-five pounders deployed in three Royal artillery regiments. There are two types of artillery: guns and howitzers. A howitzer combines the power of a gun with the high or low trajectory of a mortar, usually at moderate velocities. An alternate definition is a tube length between twenty and thirty calibers—a four-inch-diameter WW2 weapons with a barrel measuring eighty to 120 inches. Conversely, a gun is a cannon with a barrel of thirty calibers or more, firing a high-velocity round at fairly low angles. Artillery usually was towed in the Second World War but also was self-propelled, especially in armored formations requiring artillery to advance with the tanks. Before World War II, American artillery was heavily influenced by foreign designs—especially French. However, as World War I equipment aged, more modern equipment appeared in the years preceding American entry into the second conflict. U.S. infantry divisions had substantial artillery support—four batteries, each with twelve tubes. Three batteries had 105 mm howitzers and one with 155 mm guns. By D+4 (i.e., the fourth day after D-Day), the U.S. Army had 624 towed or self-propelled artillery pieces ashore. Airborne forces needed small, portable artillery to offset their firepower disadvantage, and the pack howitzer met the need. Fielded in 1927, the M1A1’s four-man crew could assemble the WW2 weapons from eight parts in a few minutes. Two Waco gliders needed to carry the pack howitzer with a jeep and trailer, while Britain’s larger Horsas could deliver the gun, transport, and crew intact. The assembled piece weighed 1,300 to 1,400 pounds, firing to ranges beyond nine thousand yards. The M2 howitzer was based on a 1920s design that was introduced to service in 1934. Weighing 2.3 tons, it was served by a six-man crew and proved uncommonly versatile. It fired a four-inch, thirty-five-pound shell about nine miles with high explosive, antitank, white phosphorous, chemical, or illumination rounds. Some 105s were fired from their landing craft while approaching Omaha and Utah beaches on D-Day. M1918 six-inch WW2 weapons. The M1A1 and M2 ‘‘Long Toms’’ were far more capable than the previous WW2 weapons, especially in range. The carriage was designed for improved mobility, and, with an eleven-man crew, it provided a much-needed improvement in division artillery. The howitzer weighed 5.4 tons and fired a 108-pound shell almost seven miles. High explosive, white phosphorous, and chemical rounds were produced. A self-propelled 155 vehicle, the M12, was delivered to Normandy and proved particularly valuable to armored divisions, which naturally advanced faster than infantry units. The gun was the M1917/1918 on an M-3 Stuart light tank chassis. Officially the Antitank Rocket Launcher, the ‘‘bazooka’’ was the most famous of American antitank WW2 weapons of World War II. Named for its resemblance to musician Bob Burns’s ‘‘gaspipe horn,’’ the WW2 weapons was actually produced in several models of varying sizes and weights. The M1 rocket launcher, developed in 1942, was a fifty-four-inch-long hollow tube weighing about thirteen pounds. A 3.2-pound, 2.36-inch diameter rocket was inserted in the breech end and was fired electrically by a dry cell battery mounted on the launcher. The most common wartime models were the M1 and M9, but all were of a common configuration—a skeletal shoulder stock, a simple pistol grip mounted below the tube, and an optical sight on the left side. The M9A1 was sixty-one inches in length, weighing about 20.3 pounds loaded. The projectile contained eight ounces of pentolite and was considered capable of penetrating three to four inches of armor at approximately one hundred yards. However, not even the M7A1 shaped-charge warhead could penetrate the front glacis of a Panther or Tiger tank. Approximately 490,000 bazookas were built in World War II. British inventiveness accounted for the spring-operated PIAT, which stood for Projector, Infantry, Anti Tank. The 3.5-pound rocket could penetrate as much as four inches of armor, and the WW2 weapons was regarded as semiautomatic because it self-cocked on firing. Forty inches long, the PIAT Mark I weighed 34.5 pounds and was sighted for seventy and 100 yards. Because it did not fire a rocket projectile, the rear of the gun had a padded buttstock while the tube was equipped with a fixed bipod and semi-pistol grip. Despite its effectiveness against many armored vehicles, the PIAT proved dangerous to fire and difficult to reload in combat. Faced with overwhelming numbers of Soviet tanks, the German army needed every antitank WW2 weapons possible. The same capability became necessary in France, where significant U.S., British, and Canadian armor was committed. Shoulder-mounted WW2 weapons roughly comparable to the American bazooka included two major types. Developed in 1943, the Panzerfaust I (‘‘Larger’’) was simplicity itself: a hollow tube 800 mm (thirty-two inches) long firing a 150 mm (six-inch) diameter grenade that projected ten inches beyond the front of the tube. It was fired by depressing a button that released a spring that in turn detonated black-powder propellant. The grenade’s 6.13-pound warhead contained a 3.6-pound bursting charge. Effective range was thirty meters, though sights on some models were calibrated to seventy-five meters. A loaded Panzerfaust weighed about 11.7 pounds—comparable to the unloaded American bazooka. The Panzerfaust II was known as ‘‘Smaller’’ because its 3.9-inch projectile yielded an ‘‘all up’’ weight of only 7.1 pounds. Its effective range was also about thirty meters, but the 1.6-pound bursting charge could not penetrate armor of the same thickness. By May 1944 production had reached four hundred thousand units. Thousands of Panzerfauste were captured, and Maj. Gen. James M. Gavin intended to issue one to nearly every trooper in the Eight-second Airborne Division for the planned jump into Templehoff Airport in Berlin. However, the German capitol fell within the Soviet zone, so the operation never proceeded. Also called Panzerschreck (‘‘Tank Terror’’) Ofenrohr (‘‘Stovepipe’’), the type 54/1 88 mm rocket launcher was 4.5 feet long and, at twenty-one pounds, nearly twice the M1 bazooka’s weight. The German projectile could defeat as much as eight inches of vertical armor and six inches of forty-degree armor out to 220 yards. However, the powerful rocket engine of the projectile threatened the gunner, who required a bulky blast shield. Deployed in 1944, the Panzerbuchse was largely replaced by the simpler, cheaper Panzerfaust. Normandy’s thick hedgerows afforded Panzerfaust gunners excellent cover for engaging Allied armor at close range. The Manhattan Project was a code name of an effort started in late 1941 to design and build the atomic bomb. In 1939, Einstein and other scientists urged the American Government to start building an atomic bomb when they heard that German physicists had discovered the secrets of splitting uranium atoms. By 1941, after the U.S. entered the war, funding were finally given to start a large-scale project. In fear of enemies hearing about the project, everything was done under top secrecy. Although the initial funds allocated to researching the atomic bomb was only $6,000 when the American government thought that such a bomb was still only a faint possibility in the far future. This amount accumulated to $2 billion, with over 120,000 people working on the project. Nuclear facilities for the Manhattan project were built at Hanford, Washington and Oak Ridge, Tennessee while the main assembly plant was in New Mexico, at Los Alamos. On July 16, 1945, the first atomic bomb was ready to be tested. The test happened near Almogordo, New Mexico, with the bomb affixed to a tower of a 100 feet high. The results were astounding, resulting in a blinding flash which could be seen for 200 miles and a mushroom cloud of 40,000 feet high. The bomb created a huge, half-mile crater and turned sand into glass. The windows of homes about 100 miles away were blown out due to the impact of the bomb. The military had to fabricate a lie about an ammunition dump exploding in the desert to explain the huge explosion without giving away the project.